In this year 2016, the great particularity of the Imaginales was that it took place during a period of strong social upheaval. Strong to the point where it ran the risk of thwarting the plans of those who were hoping to attend the famous festival in Epinal. As far as I was concerned, I was lucky enough to have been warned by an acquaintance of the shortage to come. I was therefore able to fill up before the nearby gas stations became overrun. I hence decided to maintain my trip. Not only because I didn’t fancy waiting another year for the next Imaginales, but also because this time around, the trip in question was of a more professional nature. 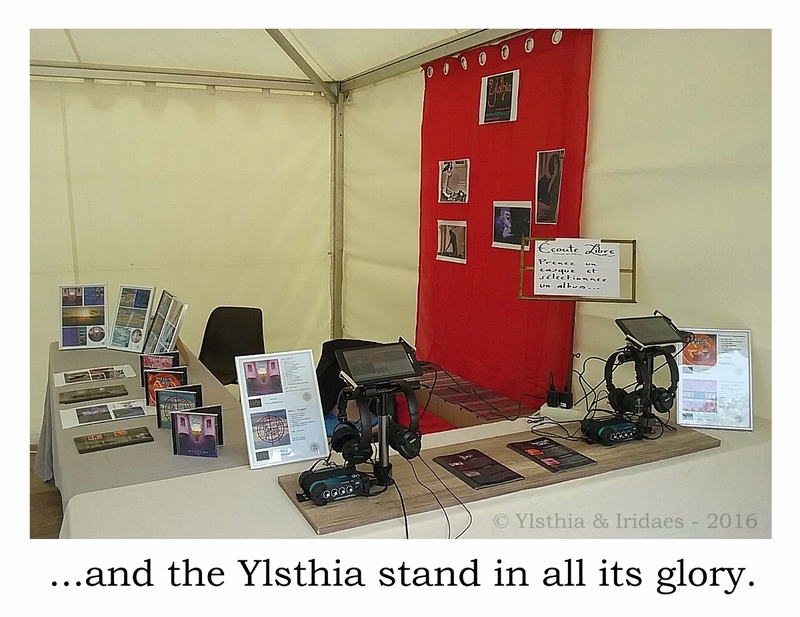 Indeed, I was to run my very own stand, or should I say more specifically, the stand of my label, Ylsthia. Only a six hour drive ahead, but my dear lady and I nevertheless get up early, as there is quite a lot to load into the car. And given the importance of the equipment in question, you will understand I need to take the time to make sure I haven’t forgotten anything. We therefore hit the road in the beginning of the afternoon. But before we head for the highway, I swing by the manufacturer's to pick up my freshly duplicated CDs. I load all four boxes into the car, and off we go to Epinal ! On the way to the highway, the gas stations we pass are either closed, or swamped with so many cars, they spill out into the road, sometimes even blocking it. The highway, however, is another story. Given how the gas stations there are more isolated, not only do they still have plenty of fuel, they are also far from overrun. Having had the opportunity to fill up preventively, our tank is quite full when we arrive in Epinal. Well, at least now we are sure we’ll be able to return home next Monday. Since tomorrow will be a very busy day, no restaurant for tonight. We drop by at a mall, grab a few salads and sandwiches, and head for the hotel where I reorganize and group together everything I will need for the stand. Speaking of the hotel, one of its strong points is the presence of… an elevator ! Oh boy is that going to be practical for loading and unloading day after day ! We get up very early this morning. The Imaginales don’t start before 10 AM (it will switch to 9 AM the following days), but the tents are available as early as 8 AM, and I want to have the time to set everything up just right. That being said, even at 10 AM there are still very few people walking around in the park. Some of the stress is therefore lifted, and I take the opportunity to perfect a few last details. Regarding the spot I am situated in, it is most charming. The tent I have been assigned to overlooks a little square (recently renamed after Ayerdhal, who passed away last year), with a lovely fountain in its center. 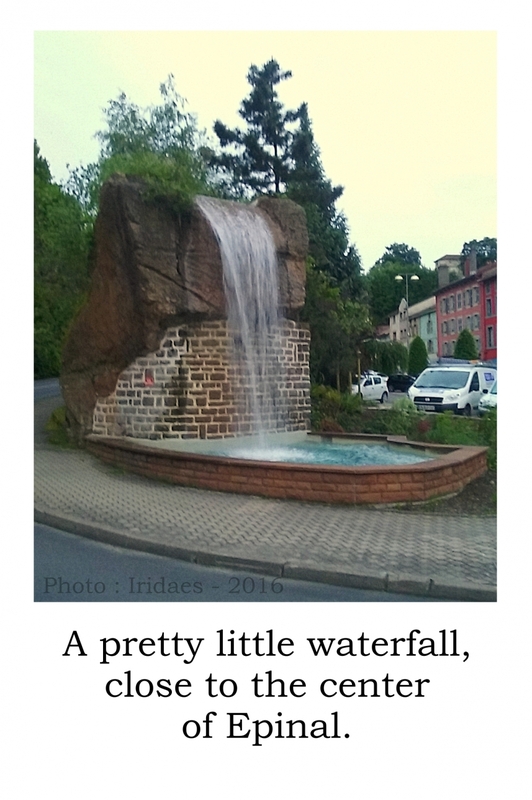 Something I am quite pleased with, since I tend to find the sound of running water to be most soothing. 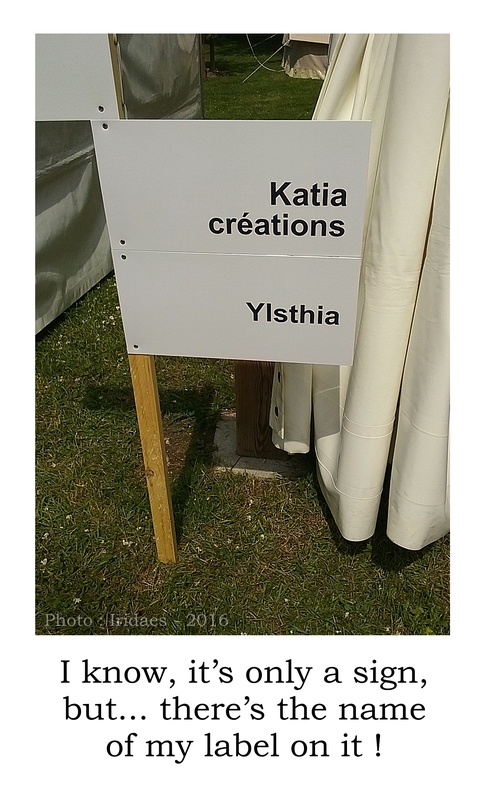 I am sharing the tent with a couple of other exhibitors (Katia Lambert and Lorraine Dossogne). We rapidly get acquainted, and get along just fine during the first couple of days (two other exhibitors are to take their place on Saturday and Sunday). Since it is only the first day, I’m not expecting people to come swarming in, and indeed things start off pretty slow. Still, I keep getting a few regular visits, now and then. My dear lady, on the other hand, is enjoying the Imaginales as a visitor. She comes to see me once in a while, which allows me to wander off a bit, but never too long, since I would like to be at my stand as much as possible. Around midday, I figure it’s about time I started making reservations in our favorite restaurants. There’s one we’d like to return to this very evening, so I dial the number straight away. Some guy answers the phone, and before I can even speak, he says “We’re busy right now, please call back”, and just hangs up. Well hey, guess what ? It didn’t make me want to call back ! The next few evenings will therefore be split between Poivre Rouge (right next to the hotel – nice and practical for when we’re too tired) and, of course, La Tarentelle for which I immediately make a reservation for this Friday. Come 7 PM, time to pack up everything we do not wish to leave on site, and to shut the tent. In order to avoid taking everything apart day after day, my lady and I both carry the board on which my listening devices are fixed. And since the whole thing is covered by a sheet, it inevitably gives the impression that we are carrying a body. This gives us the opportunity to joke around with some of the people we pass by in the morning or evening. Speaking of the day itself, I can’t say that it was hectic, but I nevertheless had quite a lot to do. I am therefore somewhat exhausted, but quite pleased at the same time. I am smack in my element, and it feels great. This evening, we dine at Poivre Rouge. As we head back to the hotel… darn, here comes a little rain… Thankfully, it won’t interfere with tomorrow’s pleasant weather. Since most of the stand is now in place, no need to get up as early as yesterday. 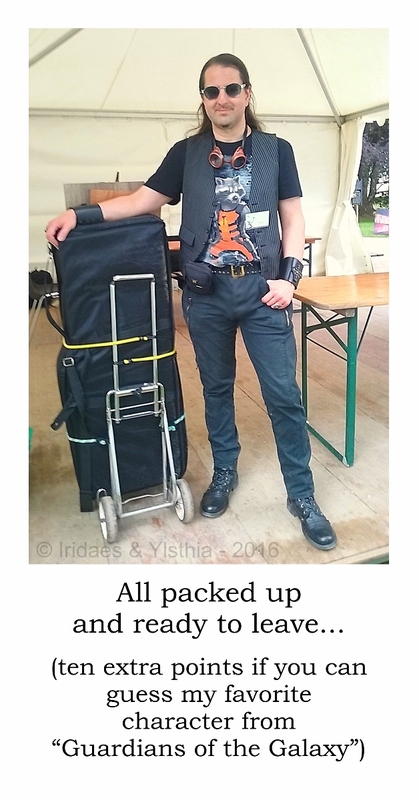 But early nonetheless, since the Imaginales now begin at 9 AM, and there are still quite a few things we need to load and unload. A big thank you to my dear sweetheart whose help allows us to save precious time. Once again, it seems like this day is going to be a hot one. All the more since I am wearing one of my frill shirts. But, just like yesterday, we are granted a little wind from time to time. One of the sides of the tent is open, allowing the air to circulate and occasionally cool us off a bit. And besides, being under the tent is certainly better than being directly in the sun. Attendance-wise, Friday follows the usual pattern. There are clearly more people than the day before. On our side, however, things remain slower than what I’d hoped. Still, I keep getting a few regular visits. It is also quite obvious that the week-end is drawing near, as more and more visitors are dressing up for the occasion. Medieval, gothic, steampunk, inspired by books or films... eye-catching outfits abound, and it is pleasing to see. 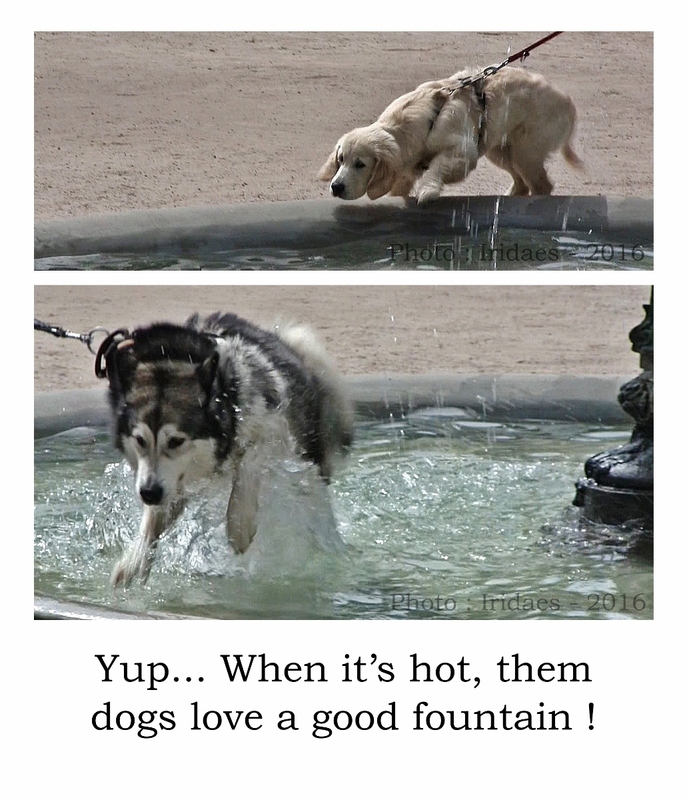 On a more amusing note, the closeness of the fountain also regularly grants us the spectacle of dogs pulling on their leashes in order to dip their paws in the water… or literally jump into it ! What determination they show, it is both funny and endearing. Once my workday is over and all my stuff has been taken back to the hotel, off we go to La Tarentelle ! A small speck of disappointment briefly rears its head, as I can no longer find one of my favorite dishes on the menu. 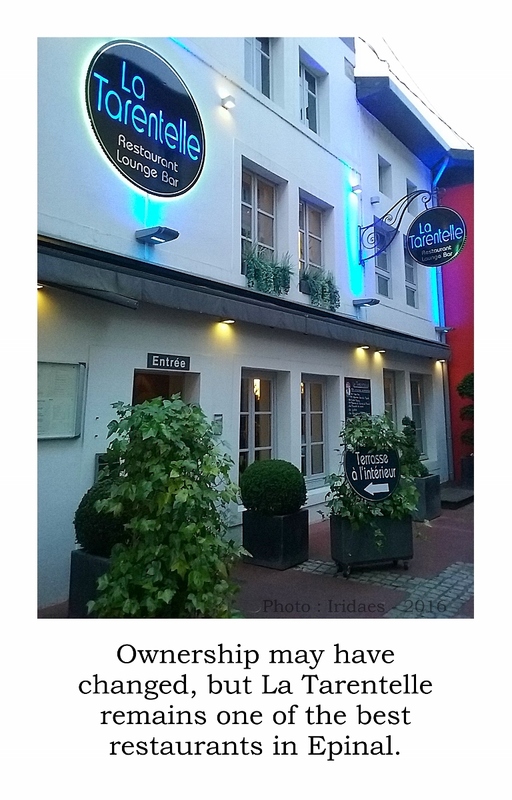 But I then learn that the restaurant changed owners in October 2015. And thankfully, it turns out that the quality of the food has absolutely not suffered from this a single bit. My lady and I once again enjoy an excellent meal. As a matter a fact, before we leave, we make sure to secure another reservation for Sunday evening. 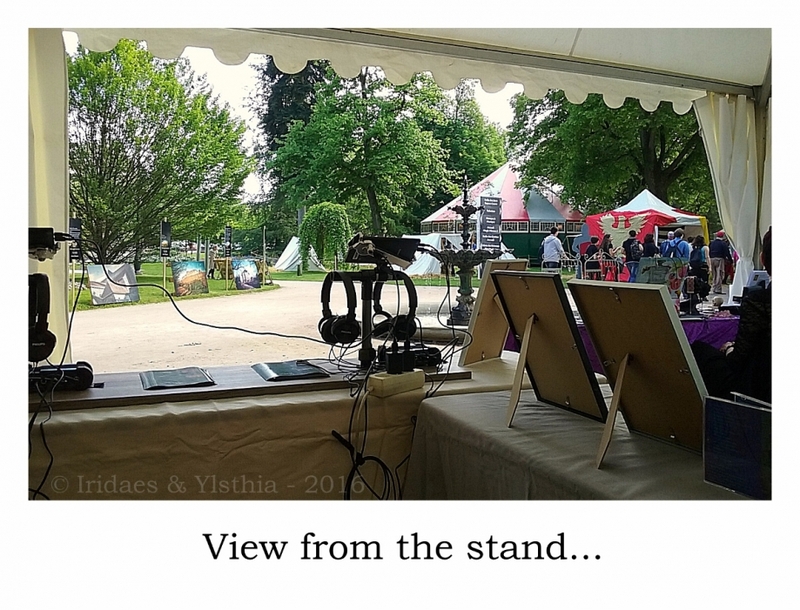 This morning, I get to meet the two new exhibitors who are to share the tent with me (Frédérique Arnould and Euydice Reinert Cend) during the last two days. They also turn out to be most forthcoming, and we once again get along very well. The sun is back as well, and there are more people than the two previous days. For some strange reason, however, this doesn’t necessarily translate into a staggering number of extra visits. Nevertheless, I do keep getting a few, and more people are interested in my music. Regarding the “book bubble” ("La bulle du livre" - the big tent where all the special guests sign their books), on the other hand, I am told it is once again packed (as is generally the case on Saturday). I actually pop over there for a few minutes, but around mid-afternoon, when there are less people, and it is fairly easier to walk around in it. Day number three is already drawing to a close, and in order to pace ourselves, this evening we have dinner at Poivre Rouge. And once again, as we leave the restaurant… it starts raining ! But that’s not all ! We can also hear thunder ! And it’s loud ! To top it off, the sky is gray. But no rain for now, I’m keeping my fingers crossed. We do, however, experience a few power failures. Yesterday’s thunder has had a bad influence on the electrical systems, and during the morning, I repeatedly notice that my headphone preamps are off. Thankfully, I can always plug a pair of headphones directly into each tablet, but the situation is still a bit stressful as I’m hoping not too many people will present themselves at once. Around 1 PM, however, the problem is definitely solved, and everything returns to normal. As a matter a fact, I should point out that Sunday will turn out to be my best day of all four ! Regarding the weather, it remains cool all day, which actually isn’t such a bad thing given how hot it was before. Since the sky remains grey, I can’t help but convince myself it’s going to rain, and how lucky we’ll be if it only starts mid-afternoon… But no. Not a drop falls, and visitors carry on strolling in the Parc du Cours. Around 5 PM, however, it does become obvious there are less and less people. And at 7 PM… it’s time to take everything apart and pack it all up. And I have to admit that it saddens me somewhat. It is now that I fully realize how quickly it all went by. Thankfully, however, we have one more pleasure left to enjoy… a second meal at La Tarentelle ! And it is once again exquisite. We furthermore have the opportunity to chat more extensively with the new owners, and their kindness is exemplary. Yes, this restaurant is definitely one I can highly recommend ! 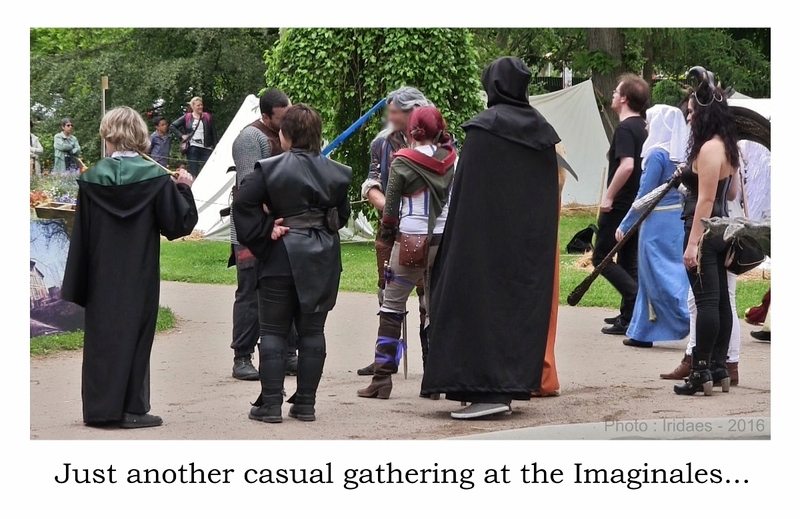 I already knew how nice it was to attend the Imaginales as a visitor. Running a stand there offered a totally different perspective. Granted, this time around I didn’t have enough time to sample all the festival had to offer. But I enjoyed it just as fully. I simply did it in a different way. 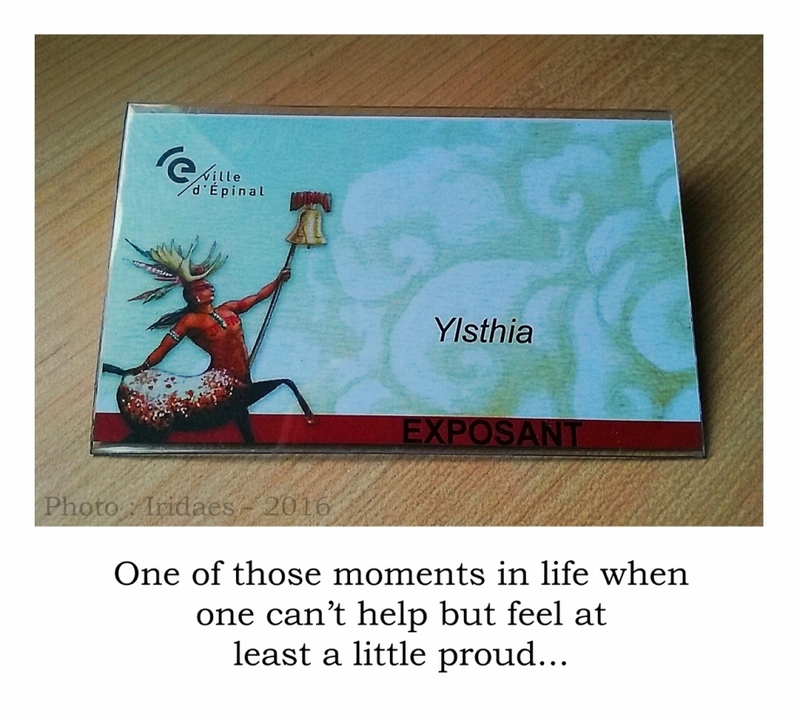 As I mentioned previously, I was in my element, and the whole experience was enriching and rewarding. 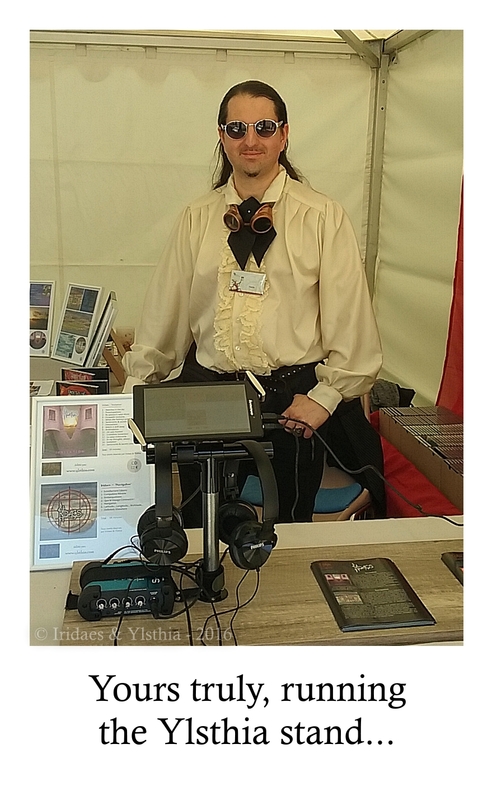 Greetings to the people I had the pleasure meeting and seeing again, and a big thank you to all those who appreciated my music and bought a CD. Thanks as well to the Imaginales team for its welcome and its work. This 2016 edition was more abundant and lively than ever. As always, having to leave was anything but uplifting. All the more since, on that day (Monday 30th), the sky had decided to provide us with an unending deluge, which accompanied us all the way back home. Then again… it also served as a reminder of how lucky we had been during the four previous days. Yes, it had rained. Yes, there had been thunder. But not once during the day. It was the least we could hope for to fully enjoy the festival. I also made a video about the 2015 edition, in which you will find a few informative elements in english : click here to see it. And of course, if you go on YouTube and type "Imaginales" (followed by the year of your choice), you will find a whole bunch of other videos (vlogs, conference excerpts, etc... but most of them in french).